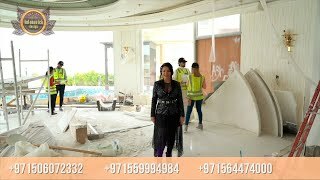 Luxury Antonovich Design - interior design studio in Kuwait. We are engaged in interior design and documentation approval. Interior design in Kuwait. Work on the project could begin with the preparation of its architectural part and ends with producing of exclusive furniture for the interior. It doesn't matter whether it is the development of the design project of a country house or palace. Preparing the design of the hotel, the entrance area or any other public space. Cleverly combining our professionalism and yours vision of ideal living space, we will create a functional, modern and comfortable interiors and exteriors, as well as offer to you non-standard architectural and planning solutions. Each the project made by us is totally unique, and customers are always satisfied with the work done by us. The scale and cost of the project do not matter - the main thing is a pleasure of working together, and the result has been appreciated!